This Acoma Pueblo polychrome jar of classic form is painted in black over a cream slip with a small concave orange-slipped base. The design consists of three diamond-shaped medallions separated by three confronting triangles, all enclosing hatched, foliate, and avian geometric patterns. Condition: Aside from very minor wear on the base, this pot is in nearly perfect condition. 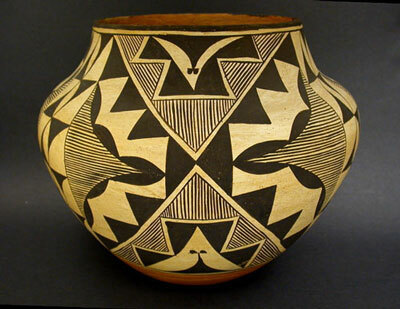 Provenance: Created at Acoma Pueblo during the 1930s, and acquired from the Bishop Gallery in Los Angeles, CA during the 1960s for a private California collection.